Some of Clarkson’s LGBT fans have been sharing outlandish, made-up quotes from the Sharp Objects star, but her PR team isn’t pleased. This is award-winning actor Patricia Clarkson. You might know her from Six Feet Under, House of Cards, or Sharp Objects (for which she recently won this Golden Globe). This is Dilara Elbir. She’s a 24-year-old film critic from Istanbul who’s based in Seattle. She’s also a big Patricia Clarkson fan. Elbir told BuzzFeed News her fandom is in part due to the actor’s 1998 film High Art, in which she played a lesbian. “Once you play a lesbian, lesbians embrace you forever,” Elbir told BuzzFeed News. She also loves Clarkson’s good humor and talent. But Elbir isn’t the only LGBT person obsessed with Clarkson. The actor has been something of a minor meme on Gay Twitter for a while now. The fandom really took off after Sharp Objects came out last year. Sharp Objects already feels like *the* show! Goth as hell. Love a sweaty smalltown nightmare. Amy Adams is peerless. The best. And Patricia Clarkson has the ghoulish menace down, from her hushed, cig charred voice to the clinking ice in her Amaretto Sours. Be still my gay heart. Some of the memes now involve sharing fake quotes from Clarkson in which she says outlandish things. “I probably have around 30–40 memes of her with funny made-up quotes about gays on my phone,” Elbir said. Let’s be clear: Patricia Clarkson has actually said none of these things out loud (as far as we know), although she is a big supporter of the LGBT community. Anyway, after Clarkson won her Golden Globe for Sharp Objects on Jan. 6, Elbir posted this on Twitter, sharing some of her favorite made-up quotes. Time passed, and then Tuesday, Elbir was alerted to a new tweet from Clarkson’s actual publicists. Elbir told BuzzFeed News she was actually working on a story about High Art when her phone lit up with the Twitter notification. She said she was mortified. Elbir wrote about the exchange in a tweet that was subsequently shared hundreds of times. I- sir it's a meme??? Elbir ultimately decided to delete the tweet rather than risk being reported for her memes, but responded to the publicists the only way she knew how. The PR team at Stan Rosenfield & Associates in Los Angeles didn’t immediately respond to a request for comment, but explained some of their thinking on Twitter. 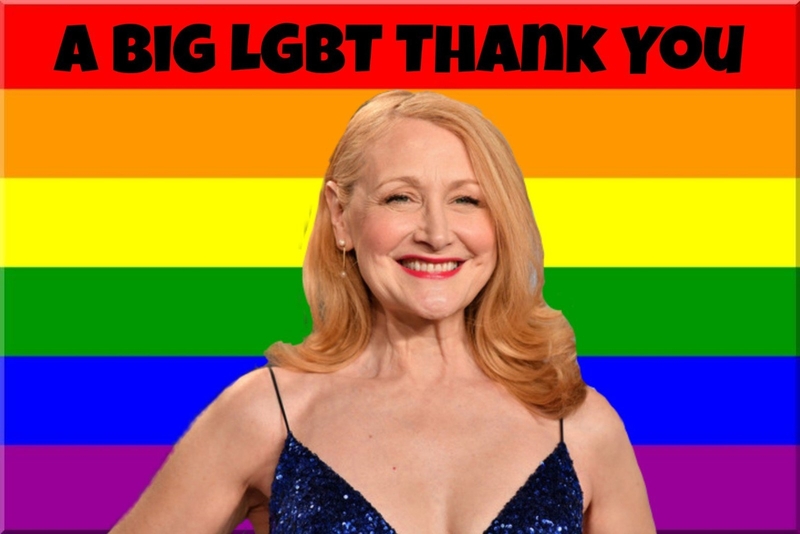 @elbirdilara If you are familiar with Patricia Clarkson's seminal work in High Art, you would know she was a very early supporter of the LGBT community. If you understand the entertainment industry, you know it's quite literally the job of a publicity firm to get her voice out there. @elbirdilara While it would have been fabulous if she said this quote, she simply did not. So now people can spew hatred at us on Twitter for pointing out she did not say a particular quote. It is our job to share her statements with the public. We are responsible for every interview you see. Elbir said she was sympathetic to the plight of the publicists. “Though obviously it was not my or anyone’s intention to act like she said those things or stain her image in anyway, I understand how the memes might be misunderstood by those who are not familiar with Twitter culture,” she said. They also ultimately shared this touching exchange, which I guess shows the power of Patricia Clarkson in bringing people together. Still, one fan had a final suggestion for Clarkson’s publicists.